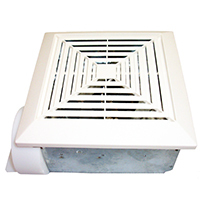 The 50 CFM USI Bath exhaust fan is designed in a decorative style to match any decor. The motor is custom-designed for use in bathroom fans, covering as much as 60 square feet of living space, providing powerful ventilation. It provides both of these benefits while hidden above the ceiling to pull moisture out of the air. This exhaust fan runs at 3.5 sones. The motor has been permanently lubricated, and is designed to work without getting louder over time.